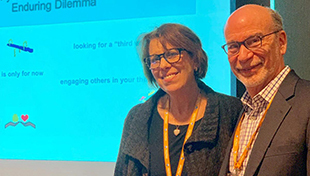 Dr. Lesley Litman and Dr. Michael Zeldin presented to a group of 50 educators from Jewish day schools across North America at the Prizmah Conference in Atlanta in March, 2019. They unveiled the findings and implications of a research study funded by the Consortium of Applied Studies in Jewish Education (CASJE). The research focused on “enduring dilemmas,” the core of the capstone project of students in the Executive M.A. Program in Jewish Education (EMA) at HUC-JIR. Graduates leave the EMA equipped with a powerful leadership practice that allows them to distinguish between problems that call for solutions and dilemmas that can only be managed for the near term. Drs. Litman and Zeldin, with assistance from clinical faculty mentors in the EMA, interviewed graduates five years after they learned about this leadership practice. The goal was to discover the impact of the learning on how these Jewish educational leaders understand their role, their decision making process and their engagement of others. Start tackling a difficult situation/problem by asking: What values are in tension? It’s okay to NOT fix all the problems! A solution can be right for now, not forever. In the coming months Drs. Litman and Zeldin will continue to share their findings with you and others in our field through presentations and in writing. We hope that, through this sharing, we will gain further insight into this practice. We would love to hear your feedback. Please contact us at llitman@huc.edu or mzeldin@huc.edu.